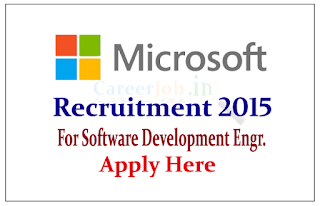 Microsoft is recruiting freshers for the post of Software Development Engineer for the year of 2015. 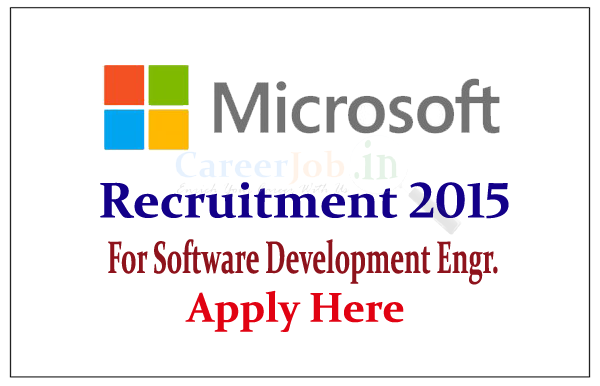 Eligible candidate can apply online here as soon as possible. Microsoft was founded by Bill Gates and Paul Allen on April 4, 1975, to develop and sell BASIC interpreters for Altair 8800. It rose to dominate the personal computer operating system market with MS-DOS in the mid-1980s, followed by Microsoft Windows. Eligible Candidates can apply online as soon as possible before the link expires, for more details check official Notification. 1. Highly proficient in C/C++/Java platform. 2. Very strong at present ideas and concepts and influence people to action. 3. Highly motivated and willing to work in a rapidly evolving environment. 4. Domain knowledge of Online Services a plus but not required.